Sales check gives you a summary of the revenue, cash spent, tax collected and the payment breakdown of the entire day. You can select between shift and batch sales to view their individual sales details. This allows you to keep track of the sales that you make and the cash that you spend throughout the day. Right click anywhere on the screen to open quick links. From the quick links, you may select the Sales check option. 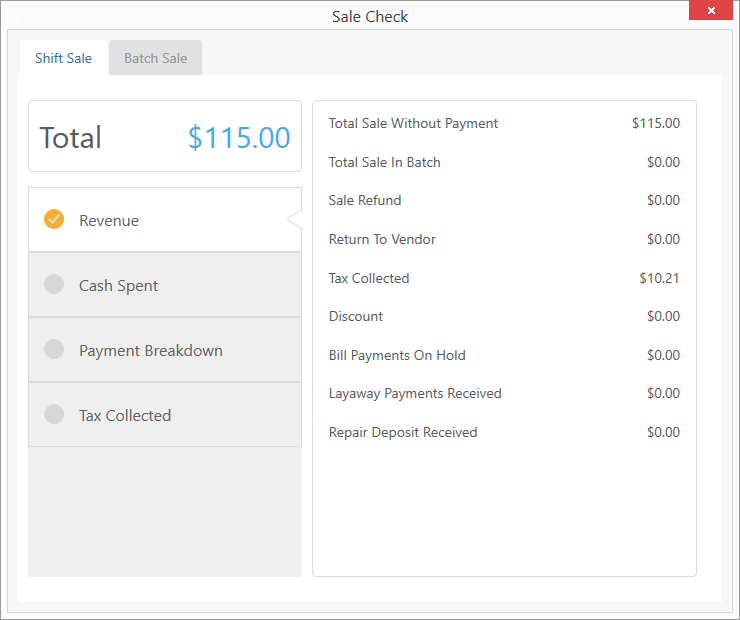 Select the Shift or Batch sale tab from the sales check window. Select between revenue, cash spent, payment breakdown, or tax collected categories. Once you select a category, its details will be presented on the right. You may click on the details listed in the box to view a detailed report.